Spend less time planning, more time doing! 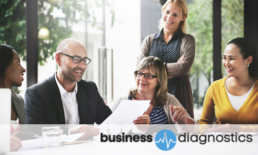 Our accelerated Business Diagnostics session provides the framework and focus to help you prioritize marketing goals, and identify campaigns with the greatest probability of impacting business results in the next 90 days. 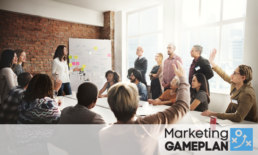 During this highly interactive workshop, our team will present our unique six-step planning model to help you prioritize marketing goals and quickly identify campaigns with the greatest probability of success. Business Diagnostics will help marketers, executives and entrepreneurs solve business growth challenges. You’ll leave armed with resources to accelerate performance, and inspired by ideas that are measurable, attainable, and above all, actionable. No business grows forever, but there are always GROWTH BUSINESSES. What do you do when your business is no longer connecting with the market as it once did, your growth is slowing and your margins are declining? Nearly every business owner I have met in my career has a purposeful and directed passion that drives their every move. It’s that energy that I find so inspirational. The indomitable belief business owners have in themselves and their dreams is by far their most valuable asset. It takes hard work to continually transform that passion into fresh ideas and new approaches to problem solving. It’s easy to get wrapped up in the mundane yet necessary daily management activities of your business. To power your continued success, make it a top priority to constantly renew your entrepreneurial spirit. Stay connected to your drive and let your passion infuse your business with big-picture thinking. Set aside time to keep focused on your current goals and inspires new ideas for taking your business to the next level. 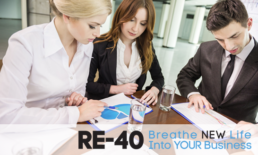 RE-40 is designed to recharge your business and take it the next level. The focus behind this is to share with business owners that it is normal to rebuild your business at some point. It is not due to failure. Conditions change and businesses have to change with it. It is an exciting phase in the business cycle and should be entered with optimism and excitement.